Elevation: minimum 324 feet, maximum 654 feet. Area Habitat: open land 22.94%, forest 62.86%, wetland 9.69%, open water 4.61%. Open under statewide regulations for all squirrel, rabbit, furbearer and turkey seasons. 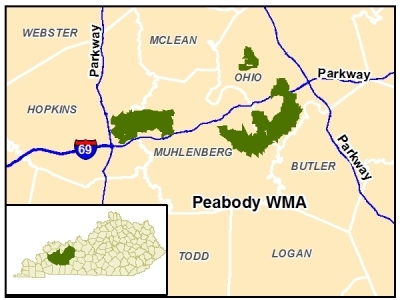 Any person ages 16 and older entering the area must obtain and carry a Peabody WMA user permit. Individual permits may be obtained through any license vendor. An event permit is available from Kentucky Fish and Wildlife to any organization to use the area for any allowable activity. Permits are non-transferable. Rabbit and quail hunters on the Sinclair and Ken units must check in and check out at a self-service kiosk and clearly display a department-provided vehicle hang tag in a vehicle. Hang tags available in advance through this website. Deer: Open under statewide regulations, except modern gun season open for 10 consecutive days starting the second Saturday in November. Portions marked by signs are closed to public access Oct. 15 - March 15. No parking or camping within 100 feet of gas well heads. Any person age 16 and older entering the area for any recreational purpose must obtain and carry a Peabody WMA user permit ($15). Individual user permits may be obtained through any license vendor. An event permit is available from Kentucky Fish and Wildlife to any organization to use the area for any allowable activity. Permits are non-transferable. Shooting hours are from one-half hour before sunrise to 2 p.m. on those portions open to hunting. Hunters may not enter the area until 4 a.m. Persons entering the area for any purpose must obtain a Peabody WMA user permit ($15). Ken Unit: That portion as bounded by Wysox Road, H2 road, H1 road and H6 road (including Island and South lakes) and as posted by signs, is closed Oct. 15 - March 15. WMA consists of numerous separated tracts located along Wendell H Ford PKWY, between Edward T Breathitt PKWY (Pennyrile) west to William H Natcher PKWY east. Access points include KY 70, KY 369, KY 176, KY 269 and US 62. Sinclair tract contains a waterfowl refuge around Goose Lake that is closed from Oct. 15-March 15. In Ohio County the waterfowl refuge around South and Island lakes is also closed from Oct. 15-March 15. Rough terrain from swampland to high ridges and deep pits; primarily reclaimed coal-mined land with numerous excavated ridges and water-filled strip mine pits (visitors should be wary). Excellent birding and fishing opportunities. Good deer, turkey, waterfowl and small game hunting. One of the better areas for quail hunting in the state. Horseback riding allowed on maintained roads. Shooting range (for single projectile firearms only; no shotshells or pistols allowed) open Monday-Saturday 9:00 AM-sunset & Sundays noon-sunset. Check online calendar or call Area office for closures or events. Mobility impaired access to permit holders in designated area, which is currently the Sinclair unit. A user permit ($15.00) required to enter the area for any type of use, can be purchased wherever Kentucky hunting and fishing licenses are sold. Owned/leased by Kentucky Department of Fish and Wildlife Resources.